Have you ever heard of a "Challenge Coin"? The video game developer behind some of the best games in the Call of Duty franchise has a totally badass way to show appreciation for employees. They adopted the military tradition of presenting “Challenge Coins” to every new employee, but also as a means of giving props for individual achievements. Challenge Coins originated within the U.S. military, allegedly with one particularly heroic Air Force pilot that credits the coin with saving his life. The coin itself indicates membership in a particular unit or branch of the military, but different coins are also often gifted as a way to honor significant achievements or milestones. In many circles, they’re used in bonding exercises that require you to keep it on your person at all times. You’ll often see or hear about soldiers leaving a coin on the graves of their fallen comrades or government officials presenting them to members of a group of brave soldiers. Presidents even present them to foreign dignitaries as a symbol of welcome. U.S. Defense Secretary Robert Gates presents a 'challenge coin' while shaking hands and posing for photographs with soldiers from the 4th Advise and Assist Brigade, 1st Calvalry Division out of Fort Hood, Texas while visiting Camp Marez in Mosul, Iraq. 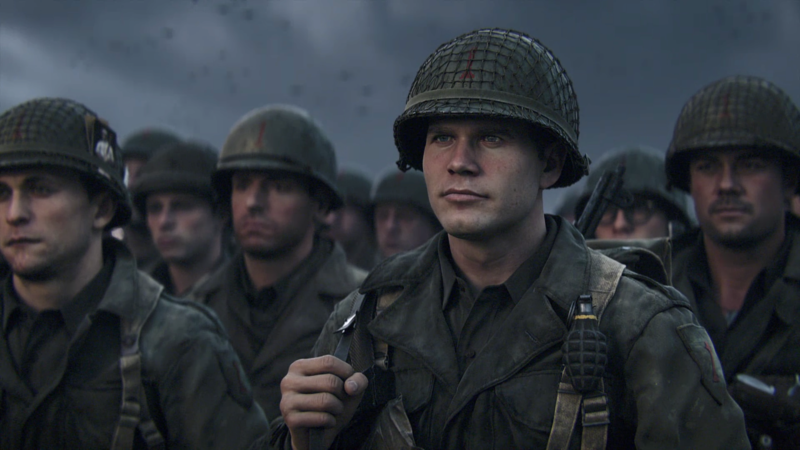 Many organizations, like police and fire departments, have adopted the tradition over the years, and so has Call of Duty developer Sledgehammer Games. At the Call of Duty World League event in Dallas, TX in December, Inverse had the opportunity to speak to Sledgehammer Games co-founder and studio head Michael Condrey about the origins and intentions for their take on the tradition. It all began when he himself was presented with a challenge coin from a U.S. Navy SEAL in 2012. Condrey first encountered the tradition in while doing research for Call of Duty: Modern Warfare 3. 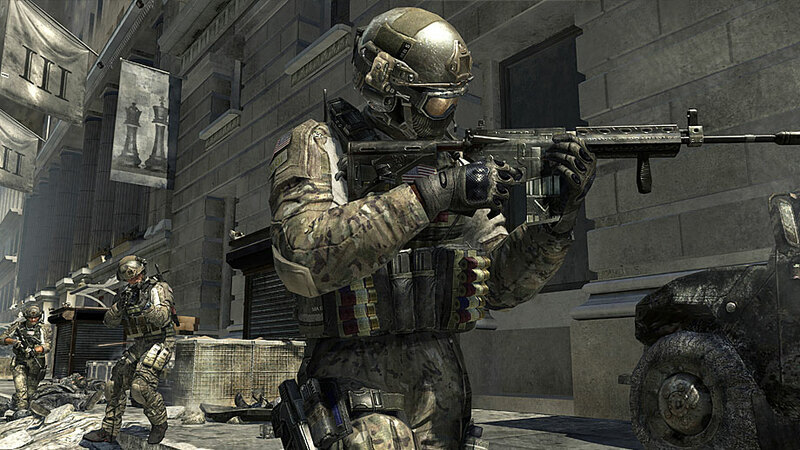 A soldier in 'Modern Warfare 3'. The research entailed engaging in a SWAT shoot house exercise with Navy SEALs — essentially using live ammunition in a training exercise that real soldiers do — for which he actually earned top marks. One of the soldier, a member of SEAL Team 5, gifted Condrey a Challenge Coin. The front of each coin carries the Sledgehammer insignia: a hammer with the Golden Gate Bridge in the background. 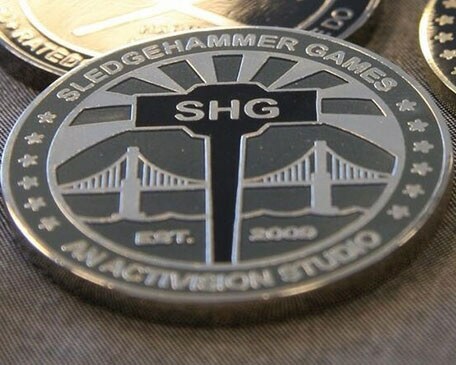 The official challenge coin of Sledgehammer Games honors a military tradition. Another important aspect of the challenge coin culture at Sledgehammer is peer recognition. In the military, one might award a challenge coin for acts of bravery, courage, valor, or kindness. The Hard Hitter Award Challenge Coin. Remembering these values and replicating coin culture is anecdotally integral to keeping Sledgehammer’s turnover incredibly low — below 1 percent — in an industry where the standard is much higher at around 20 percent. “We set very high hiring standard and maintain a commitment to providing a workplace where developers will want to stay for many years, Condrey told Digital Trends in 2013. If the sales and positive critical response to their latest game, Call of Duty: WWII is any indication, then Sledgehammer Games is definitely doing something right, and these Challenge Coins no doubt play a huge role.